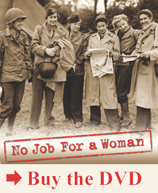 Marguerite Higgins, a young and fearless reporter for the New York Herald Tribune, had entered the war late and was determined to prove herself as a reporter, not as a woman reporter. Her goal was to do front page, above the fold, headline news, not stories directed by the Office of War Information. Not only was she young, she looked like Marilyn Monroe, and the whiff of sexual innuendo always plagued her. In late April 1945, she and a Stars and Stripes reporter commandeered a Jeep , drove past the frontlines into Nazi-held territory, where, to their horror, they discovered the concentration camp at Dachau. Realizing that several rifles were trained on her from the watchtower, Higgins knew it was futile to run. Instead, she demanded, in German: “Kommen sie her, bitte. Wir sind Amerikaner.” (Come here please, we are American.) Twenty-two guards walked out with their hands up. She and her colleague entered the camp, where they announced to the prisoners in English, German and French that they were free. She went on to become the Tokyo bureau chief for the Tribune. As a result, she was one of the first American reporters on the ground when the Korean War broke out. Only with the intervention of General Douglas MacArthur was she able to stay in Korea to cover the war, for which she became the first female reporter to be awarded the Pulitzer Prize in 1951 for her international reporting there. Hurry Up Sister Productions © 2019. All Rights Reserved.